J Clin Invest. 2004;114(5):604–604. https://doi.org/10.1172/JCI22882. Carl Zimmer. 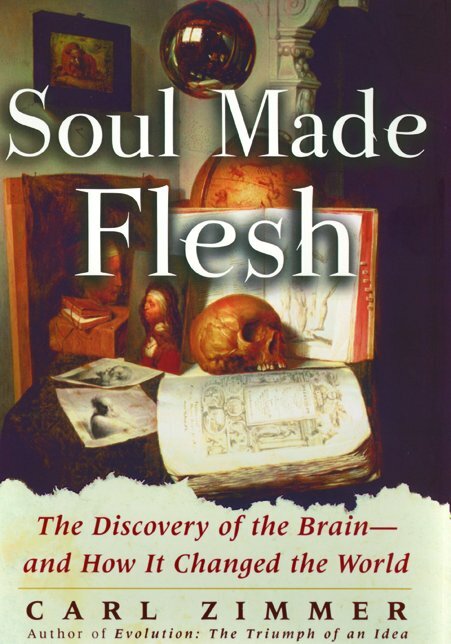 Soul made flesh The discovery of the brain — and how it changed the world. 2004. Free Press, New York, New York, USA. 367 pp. $26.00. ISBN: 0-7432-3038-8 (hardcover). The soul was once thought to be an ethereal thing with an interface between the macrocosm — stars and planets — and the microcosm — the individual. Its home in the body was the heart and liver, and from there it was distilled from the blood via the rete mirabile at the base of the brain into the ventricles. The brain itself was believed to be unimportant except in its support of the ventricular system. In his book Soul made flesh: the discovery of the brain — and how it changed the world, Carl Zimmer concentrates on the development of ideas throughout history that eventually established a role for the brain in the modern world. The focus of his study is an examination of the ideas that developed in late 17th-century England, but concepts that were popular in earlier periods, going back to the time of Aristotle, are also introduced. Many historical books focus on individuals’ lives, but it is often difficult to understand why or how their theories developed. By providing historical background and focusing on ideas, Zimmer makes a number of disparate individuals (alchemists, anatomists, astronomers, and physicians) seem almost to interact. He develops the connections among them and the weaknesses and strengths of their views on the role of the brain against the background of the time in which they lived. In its beginning chapters, Soul made flesh describes in detail the theories of early philosophers and anatomists as well as alchemists and astronomers and discusses how each set the stage for the next scientific advance. Having provided this historical platform, Zimmer then focuses on events in 17th-century England. These were difficult times for the original thinker. The world was unstable; new thoughts and ideas were often in conflict with religious beliefs and nationalistic convictions and were a challenge to church doctrine and accepted Aristotelian views. England was in turmoil for much of the 17th century, and this influenced individuals like William Harvey, Thomas Willis, and their contemporaries at Oxford. Willis was a royalist when it was dangerous to be one, yet he managed to be productive despite the difficulties his beliefs fostered. Zimmer has a superb grasp of these factors and shows how ideas that would appear unusual in this century seemed reasonable in an earlier time. Zimmer reviews ideas about the brain that were in vogue until challenged by the anatomist Andreas Vesalius in 1537, who corrected many errors in Galen’s writings that had been accepted for centuries. Descartes was the first to put the soul in a cerebral structure — the pineal gland, which was situated in a place that controlled the movement of fluid in the ventricles just above the cerebral aqueduct and which received bilateral fibers. After Harvey’s discovery of the circulation of the blood in 1628, at Oxford, his contemporaries and successors continued his experimental approach. By combining clinical observation, postmortem examination of patients, and experimental data, members of this Oxford circle, primarily Willis, came to realize that the brain itself was an organ with a defined structure and function. Willis performed many postmortem examinations and began concentrating on the brain and its structures. Using the techniques of Robert Boyle, who had discovered that putting the brain in “spirits of wine” changed its consistency from that of butter to that of boiled egg, allowed Willis to study the fine anatomy. Working with Richard Lower, Willis injected the cerebral arteries with a variety of substances and then traced their paths deep into the brain. The two soon recognized that the ventricles were not as important as had been thought. Willis published three books primarily related to the nervous system. The first, Cerebri Anatome, was a unified study of the nervous system both centrally and peripherally and set the nervous system up as the center of the individual, dispensing with the concept of the humors of antiquity. In the second, Pathologiae cerebri et nervosi generis specimen, he discussed epilepsy, convulsions, and hysteria as coming from the brain. His third book, De Anima Brutorum, located the soul itself in the brain. This had to be carefully written because of its conflict with centuries of church doctrine. It established the new field of “neurology,” a term Willis coined, and ushered in the neurocentric age, which is still flourishing today. Each chapter of Zimmer’s book is preceded by an engraving, most of which were done by Christopher Wren, Willis’ colleague. These engravings beautifully detail the fine anatomy of the brain, including the structure at the base that now bears Willis’ name. Willis and his colleagues firmly established the brain as the organ whose function was to house the soul and act as the seat of emotion and thought. This concept paved the way for the next major advance, which came a century later with the phrenologists and the development of ideas concerning the localization of brain function to particular areas of the brain. Soul made flesh belongs in all libraries and would make a superb gift for the neuroscientist or anyone who works with the brain. Zimmer’s knowledge of the period and depiction of the individuals who were responsible for many important scientific theories make for an exciting read. This was a hard book to put down.